Spencer Tracy and Katharine Hepburn’s years at MGM. 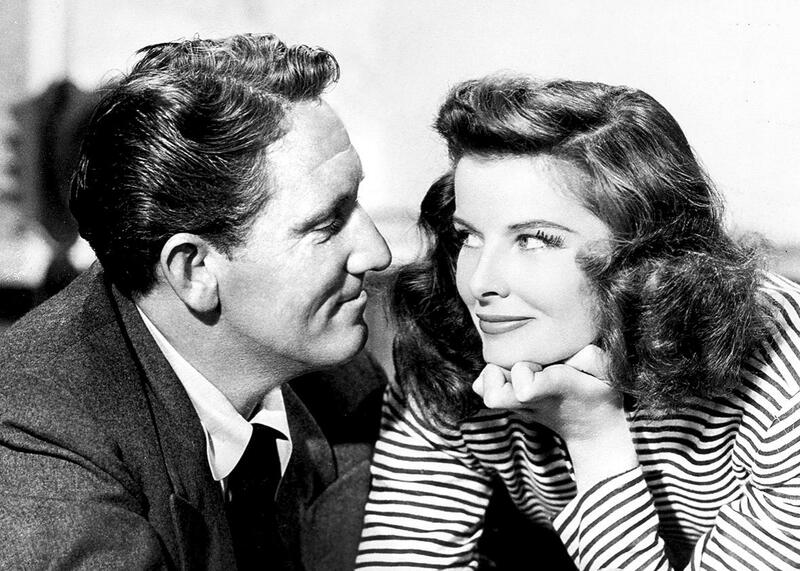 The remarkable professional and personal partnership of Spencer Tracy and Katharine Hepburn. Spencer Tracy and Katharine Hepburn in 1942. You Must Remember This, the podcast that tells the secret and forgotten history of 20th-century Hollywood, has joined Panoply. And when each episode airs, creator and host Karina Longworth will share some of the research that went into the episode in a transcript excerpt here on Slate. Listen to the complete Episode 9 below, and subscribe to You Must Remember This on iTunes. Screenwriter Garson Kanin had conceived Woman of the Year as a love letter to Katharine Hepburn, who in the late 1930s he was trying to romance, with great difficulty. In 1941, Hepburn was able to set up the script at MGM, where she had just made her career-resurrecting hit, The Philadelphia Story. Hepburn was essentially secretly producing her movies at this point—she was working tirelessly during the script-development stage to shape each film. In Woman of the Year, Hepburn would play a sophisticated political columnist attracted to her opposite, a salt-of-the-earth sports reporter. Spencer Tracy was Hepburn’s choice for the sports reporter, because to her he represented the epitome of the American male of the time. But Hepburn believed Tracy barely knew who she was. Tracy did know who she was, but he wasn’t exactly impressed. He had heard she was a diva and suspected she was a lesbian. When they were first introduced on the MGM lot, Hepburn lived up to her ballbuster reputation, looking Tracy up and down and derisively commenting on his height. But Tracy agreed to make Woman of the Year because Philadelphia Story had showed a new side of her—the soft center under the granite exterior, the vulnerable woman who really craved a man who could tell her what to do. This would become the essence of the Hepburn and Tracy on-screen dynamic: She would play a liberated woman, often one enjoying some kind of success in a man’s world, whose capability and independence were initially attractive to the man, but eventually her stubbornness and inability or unwillingness to subjugate her own needs and desires to her mates would become a turnoff. Her regret in the face of his admonishment and punishment would bring the couple back together. This dynamic invented for the movies was not far from what was going on in real life. The real Hepburn was attracted to the real Tracy because he performed a similar trick in their real lives. She knew that he would leave her free to be herself but that he also wasn’t afraid to tell her when enough was enough. He was the only person who could tell Kath, as he called her, to shut up. Tracy would bring the “womanly” side of Hepburn further to the fore, on screen as well as off, to the extent that nobody was sure what was the chicken and what was the egg: Was their off-screen relationship captured by the camera, or did the on-screen chemistry bleed off the screen into real life? Hepburn herself would later describe the growing attraction between her and Tracy in language that echoed, or conflated, the action of Woman of the Year. She remembered taking note of their common freckles, which their characters do as foreplay in the movie. The real Hepburn recalled being so nervous sitting close to Tracy while they were filming the bar scene that she spilled a glass of water and ended up under the table with a napkin, continuing to say her lines as she mopped up. In the movie, the camera cuts to her under the table as she clumsily/nervously picks up her spilled purse. At this time, Tracy was the top American male box office star. He could have any woman he wanted and usually did. By the end of 1941, Tracy was in a serious but unusual relationship with Hepburn. Tracy had ceased living with his wife Louise, but he didn’t live with Hepburn, either. For years, Tracy took pains to keep his relationship with Hepburn secret from his wife, underestimating Louise’s intelligence in assuming that she couldn’t figure it out, and then he’d do things either thoughtlessly or self-destructively to rub it in her face. The legend of Hepburn and Tracy was that they couldn’t get married because the Catholic Tracy couldn’t get a divorce. His relationship with Hepburn was kept unofficial for many more reasons than that. All things being equal, Hepburn would later claim that while she was totally devoted to Tracy, she was never really sure of how he felt about her, and observers of their relationship have suggested that she gave more than she got. Certainly there were periods where he didn’t act like a guy who was deeply in love with one woman, even if he was married to another. Sometimes he just acted like a prick. On the set of the World War II fantasy A Guy Named Joe, according to some reports, his sexual harassment of co-star Irene Dunne was constant and ranged from whispering dirty words to pressing his erection against her. Louis B. Mayer took Dunne’s threat to quit the film if Tracy kept on harassing her seriously. Mayer came on set, and after watching rushes of Dunne’s performance, he declared, “If I’m firing anybody, I’m firing Tracy, not her.” Instead, Tracy got a talking to and the harassment stopped. By this point, Hepburn and Tracy had already made two movies together, but she may have just been getting a sense of what she was getting into. After Woman of the Year, beginning on a visit to New York and continuing in California, after over three years sober, Tracy went on a drinking binge that lasted 19 days. At first, Hepburn was convinced that alcohol was something Tracy needed to learn how to live with in moderation. He started trying to just have a couple after a workday, like everyone else. When things would get out of hand, as they seemed to when Tracy was on a USO tour in 1944 and then when he and Hepburn were shooting the film Without Love, she would reject the suggestion that he should go to Alcoholics Anonymous, in part because he was too famous to be anonymous. For that same reason, Hepburn wanted Tracy to move out of the Beverly Hill Hotel, where he was prone to binge, but she was also afraid of the scandal that could happen if she were to move him into her house and anyone found out. Tracy went through detox in May 1945 and managed to stay sober for a while. He made a long-threatened return to the theater with a play called The Rugged Path, which turned out to be a disappointment. Tracy’s performance was better reviewed than the play, but he realized that after mastering the art of film acting, he now found playing the same part every night to be a bore. He longed to be back at MGM. But on the set of his next film with Hepburn, The Sea of Grass, Tracy told a journalist that he couldn’t wait to get back to the stage. Hepburn was planning to star in As You Like It in New York, and Tracy started threatening to go with her. Negotiations with MGM to free up time in Tracy’s schedule proceeded to a certain extent, and then there was a meeting in Mayer’s office, involving Tracy’s wife Louise. Louise apparently said, in no uncertain terms, “I will be Mrs. Spencer Tracy until the day I die.” Shortly after that, Tracy told a journalist that he didn’t think he would play a romantic interest to Hepburn in a movie anytime soon. In fact, it would only be about a year, because Hepburn happened to be available to step into State of the Union when Claudette Colbert dropped out. Tracy’s personal and professional lives were incredibly intermingled and extremely complicated. He was married to Louise, whose life’s work was an extremely noble clinic for deaf children, which was partially funded by Tracy’s MGM salary and by donations brought in by his standing as a major star. He was involved in a serious romantic relationship with Hepburn, which he would never acknowledge to his wife, even though it was apparent to everyone and even though his continued standing and ability to draw a high salary at MGM owed in large part to the movies he and Hepburn made together—The Sea of Grass, for instance, was a huge hit, reviving Tracy’s star power when it had been on the downswing. Even if he wanted to, which he didn’t, he couldn’t break it off with Hepburn to go back to his wife because their on-screen romance was too valuable for both of them, and because of his guilt over his deaf son John, he would never leave Louise for Hepburn, who didn’t want to get married anyway. Tracy and Hepburn starred together in Adam’s Rib, which many people believe was their best film together, although like most of their movies, it was a hit on the coasts and completely unpalatable to middle America. And then Tracy finally had a massive, demographic-sweeping hit on his own with Father of the Bride. This would mark the high point of Tracy’s power at MGM. Hepburn’s own contract with MGM had lapsed, and now she was only invited back for Tracy vehicles like 1952’s Pat and Mike and was in fact spending much of her time on the stage. They were apart a lot, and Tracy started looking for love elsewhere. He pursued Joan Fontaine, fruitlessly, and then began an affair with Gene Tierney, whose hopes that Kirk Douglas would marry her had been recently dashed. Tracy apparently wrote Tierney a letter promising to marry her, which was probably just a seduction move, but which Tierney then turned around and showed to Douglas in order to try to win him back. Tracy and Tierney were starring together in the film Plymouth Adventure, a mediocre Mayflower movie that forced Tracy to contemplate exactly what it was that he was doing with his career. He longed for the freedom of going freelance, but he still needed the guaranteed pay of his MGM contract, in part to help support his wife’s clinic. The only movie he really wanted to make was an adaptation of Ernest Hemingway’s The Old Man and the Sea, which kept getting delayed as Tracy dealt with his MGM commitments. Gossip columnists started reporting that Tracy was leaving the studio. And then in the spring of 1954, Tracy and Hepburn reunited in London, and while there, a London tabloid ran with a story about “the secret romance of Spencer and Katie.” The article got a few things wrong, but it was right in spirit, and now neither of them could pretend that their relationship was secret. Back in the states, Tracy was replaced on the movie that would come to be called Bad Day at Black Rock. Tracy’s datebook, where he’d record his activities and alcoholic slip-ups, contained one word the next day: “Gin!” His relationship with MGM was over. He and Hepburn made Desk Set, an office romance for which they were both a little too old, at Fox. Tracy got his Old Man and the Sea movie, finally, which would earn him another Oscar nomination. He’d in fact be nominated for almost every movie he made over the next decade, including Inherit the Wind, Judgment at Nuremberg, and his final film with Hepburn, Guess Who’s Coming to Dinner. By that point, both Tracy and Hepburn had been off the screen for years. He had suffered a variety of health problems in the interim, was officially diagnosed with heart disease and diabetes, and was attended to during this time by Hepburn, who moved into her lover’s house for the first time for the purpose. He had a prostate operation in 1965, which didn’t go well—within a week, he had slipped into a coma. But he recovered, and in 1967 he agreed to star with Hepburn and Sidney Poitier in what director Stanley Kramer was calling “a comedy of miscegenation.” Kramer had to mortgage his own salary to insure the notoriously weak Tracy for the film. Tracy struggled to keep his energy up, but the crew and cast worked around him. A few weeks after he wrapped his part, Tracy dropped dead in his kitchen—his heart, as Hepburn would put it, “just stopped—BANG! The box broke.” She found him and called the doctor. Who called Louise.